The art of screen printing has been around since the 1900s when it was first introduced as a way to create print advertisements. As the years went on, this medium became the canvas for many famous artists. Roy Lichtenstein and Andy Warhol, for instance, were well known for their screen printed artwork. Although screen printing is still considered an invaluable method in the field of print advertising, it’s most commonly used for apparel. This method has played a huge role in the realm of bootleg tour merch, particularly brought about by the Grateful Dead. But today, screen printing plays a vital role in the world of branding. If you’d like to explore the world of screen printing, choose Corporate Connection! Have you ever wondered about the process of printing designs on garments? How do designs remain on the piece of apparel, without fading away as time goes on? 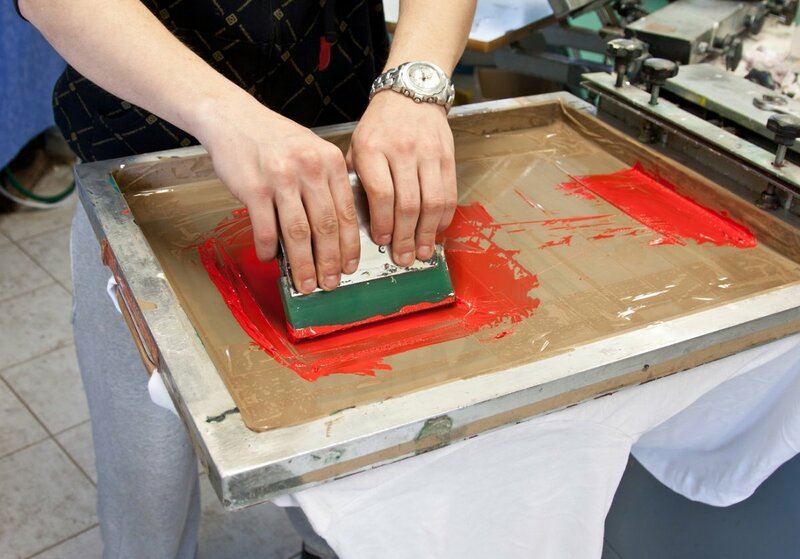 It may seem like magic but it’s mostly due in part to the age-old tradition of screen printing! Today, there are four great screen printing options from which you can choose. These options are plastisol inks, discharge printing, 4-color process printing, and waterbase printing. Different options work best with different materials, depending on what you want the end result to be. Here, we’ll briefly break down the different screen printing styles so you’ll gain a deeper understanding of the process. When you picture screen printing, you’re more-than-likely picturing the plastisol ink printing process. These inks are thick so they sit atop the piece of garment, making it a great option for any garment style. Plastisol is the “traditional” printing style. The discharge printing process basically creates a design by removing the garment’s original color. By bleaching out the dye of the shirt, the shirt’s natural color remains. Now that the dye has been bleached out, any color-base ink can be used to bring the design to life. This option is much lighter than plastisol inks and, thus, can produce the most detailed images. Cyan, magenta, yellow, and black are the four colors to which this process refers. Unlike the previous two options, 4-color process printing is often reserved for lighter colored garments. It’s also a great option if the colors of the design don’t need to be as exact as possible. This process is often used on packaging. If you ever look closely at a cardboard box, you’ll notice that the designs are actually an array of cyan, magenta, yellow, and black dots. This exact process can be used for your garments! Since most screen printing processes make use of thick inks, the design ends up being thick and stiff. Waterbase inks, on the other hand, are soft and breathable so the end results are just that, soft and breathable! Since it’s derived from water, the ink is able to produce the softest results. Whether you know exactly what you need or you’re completely unsure about where to go next, Corporate Connection can help! We even offer in-house design services so we can come up with your very own logo. Screen printing has remained one of the most popular printing options and it shows no signs of stopping. Give us a call today to learn more about what we have to offer!